Cash is king. Right? Yes, and no. Holding at least six months of living expenses in an emergency fund is a smart financial move. Life happens. An unexpected trip to the emergency room. Car repairs. A job loss. These are all good reasons to hold about six months of expenses in cash. Beyond that, however, you may be missing out. Economists call this "Opportunity Cost," or the loss of a potential gain you might have had if you made a different choice. Holding large amounts of cash, might give you some psychological comfort in the present. But, it doesn’t do "Future You" any favors. Why not? Over time, inflation erodes the purchasing power of your cash. Inflation occurs when the price of the same good or services costs more than it did a year ago, five years ago or twenty years ago. The average cost of a new house climbed from $19,300 in 1963 to more than $150,000 in 2016. The consumer price index is about 500 percent higher in 2016 that it was 40 years ago. That means that the average item in the grocery store costs 5 times more than it did in the early 1970s. From 1990 to 2013 the cost of an average car doubled from $16,950 to $31,352. In 1990 a loaf of bread cost 70 cents and in 2013 that same loaf cost $1.98. 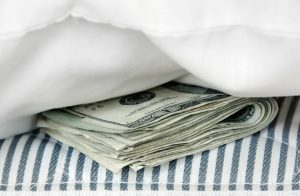 Americans are holding about 58% of their investable assets in cash, according to a Blackrock investor survey. When you want to protect your future, that percentage is too high. “Holding cash means you are actually losing money every year as inflation drains away the purchasing power of your cash." About six months of living expenses in cash is important. Beyond that, you are facing serious opportunity cost. Many Americans are understandably hesitant to put fresh funds into the stock market at its current overvalued, record-high levels. In fact, the current rally in stocks has left many Americans exposed to more risk than they may realize. If you intended to have a 40% allocation to stocks, 20% allocation to bonds, 25% allocation to cash and 15% allocation to tangible assets like physical gold and silver, you are likely far overstretched in the stock category right now. Review your statements. If the latest run up in stocks has pushed you beyond your intended stock allocation level, book some profits. Many Blanchard clients are using the new all-time highs as a smart time to take some money off the table in the stock market and plough those assets into tangible assets like gold. One of the most brilliant fund managers of our era – Bill Gross, portfolio manager at Janus – warned investors to "be careful in 2018." The current abnormally low level of Treasury rates leaves money managers and individual investors few options to "hedge their risk." "Should a crisis arise because of policy mistakes, geopolitical crises, or other currently unforeseen risks, the ability to protect principal will be impaired relative to history," Gross said in his most recent letter to investors. If you are sitting on more cash that you need, put your cash to work. Buy gold and silver now to protect your future purchasing power and to hedge against a downtown in the stock market. Gold has generated strong returns in 2017 – and that is despite a strong stock market and rising interest rate environment. Now is not the time to chase returns in an aging and overvalued stock market. The case for gold has never been stronger. Put your cash to work. Tomorrow, it will be worth less than it is today. In five years, that cash will be worth even less.